Most people think of ping-pong as something played in a basement rec room, or perhaps a garage. The Kettler Match 5.0 offers the opportunities to not only play the game outside but to also leave the table outside, claiming their table is “absolutely weatherproof.” On paper, this table seems to have a lot of good design and quality materials put into it. 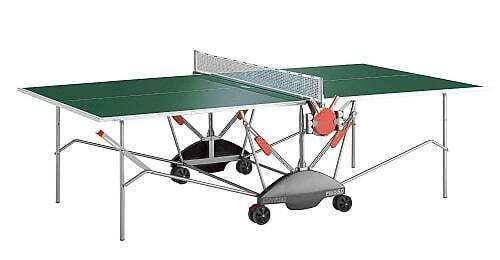 True aficionados may note a marked difference in the bounce of this table compared to that of an indoor model, but in general, it provides a great playing field for indoor or outdoor table tennis matches. Kettler Match 5.0 Outdoor Table Tennis Table constitutes of an aluminium sealed composite non-glare tournament top. It has been built to be completely weather-proof even under the toughest of rains. The game table is resilient and inclusive of a high quality locking mechanism to provide maximum security and trouble free usage. The key feature of a Kettler 5.0 is its 4 swivelling wheels designed for ease of transport. Locking wheels facility is available diagonally along with safety breaks and a wheel shroud for protection. The Kettler 5.0 also provides an exclusive feature of playback for solo matches or warming up sessions. All of this and more along with a provision for storing balls and holding a racquet make it a coveted possession this summer. The construction is sturdy and Kettler 5.0 promises undying performance and quality with a three year warranty. – There is a side racquet and ball holder for easy storage included in the whole package. – The Kettler 5.0 is inclusive of a fixed net for automatic tensioning for maximum tautness. – Kettler Match 5.0 Product Dimension: 180 x 30 x 60 inches (W x H x D), Weighs 120lbs. – Three year warranty on the complete product. Every single user has rated this table tennis board 4 ½ to 5 stars out of 5 in their ratings. With a straightforward user manual, the table tennis is not difficult to put together and takes only a couple of hours. It is manageable with a few helping hands by your side and users have described the product to be terrific once it ready for play. Serious play during the evenings with added lights is also no longer a problem with the anti-glare coating on the sturdy ¾ inches aluminium table. The automatic tensioning device is quite popular since it helps hugely in maintaining a taut net at all times. From a customer point of view, being completely foldable, the table is easy to store. After collapsing, the table measures only 24.5 x 64 x 67 inches (W x H x D) as compared to 180 x 30 x 60 inches (W x H x D), when it is open. The added feature of security and trouble free usage makes Kettler 5.0 an excellent home game table. The table is sturdy and impressive with its fit. Only the net needs replacement after a while. It is definitely worth a buy for any table tennis fanatic. This is a common requirement of any table tennis arrangement. If you are looking for a table with extras such as ball and paddle holders, the 5.0 has those. However, take your search a little deeper and you will find that this table rests on an impressive frame that glides along quite smoothly thanks to four sturdy 4-inch swivel wheels and an anti-tilt trolley. Do not let the ease of movement concern you, however. Another feature of the design is the inclusion of optimally positioned safety brakes. Any table advertised for outdoor use must have a frame capable of handling changes in weather. The legs are round and made from powder coated and galvanized steel. This means they stand up to weather conditions without showing it – with proper treatment, they should not rust. The frame of the match 5.0 table attaches to the legs with aluminum tubes, and the 1-inch apron that surrounds the tabletop is also aluminum. The apron was designed to cradles the tabletop so that it resists warping. That top is also aluminum, specifically 0.875-inch of an aluminum composite completely covering a resin-treated board. Kettler’s ALU-TEC process controls expansion and contraction, preventing warping of the playing top. Getting the right bounce on an outdoor table is an ongoing issue for many manufacturers. Kettler states, “The materials for our aluminum table tennis table are tested with reference both to the bounce behavior of the table tennis balls and their reaction to various climatic conditions.” However, some find it a little more sluggish than indoor tables. The bounce of an indoor table and an all-weather table is bound to differ, and more advanced players may notice it. Nonetheless, despite some nuances in bounce, the playing surface is excellent. Probably one of the nicest features of this item is its bounce back mode. Many tables offer this, and most of those, when one side is folded up for warming up or solo practice, leave a sizeable gap between the flat and vertical surfaces. The Kettler Match 5.0 has a much smaller gap, so if you want to avoid chasing down balls that escaped through the gap behind the net, this is a good choice for you. Additionally, there is no need to remove the net when folding up the table. Speaking of the folding up of table sides, as with most tables on the market, this one includes a safety lock to keep the folded table from unintended opening. Kettler’s Safety-Fold ® with Dual Lock Safety is a patented system to prevent unintended opening or closing of table, and they claim one person can do it. Aside from minor comments about a slower bounce and less than ecstatic feelings about the wheels on this model, its biggest drawback is the absolutely horrible assembly directions supplied with the unassembled table. Considering the price tag of this table, top-notch quality and design should be expected, and clear, easy to understand assembly directions should be part and parcel of a high end product. This is where the Match 5.0 comes up short. Putting the 5.0 together may not be technically difficult, or at least it would not be so if they provided proper guidance. The directions contain few if any words and instead rely upon pictures (think of IKEA furniture assembly directions) that lack detail and can leave you guessing as to what goes where. This issue becomes especially maddening when parts are missing, which happens far too often with unassembled items. However, if you go to the Kettler website, they provide a video showing all steps of assembly. It starts with a screen that reads, “Please use this video in conjunction (sic.) the assembly manual provided.” Beyond that, it is all video and background music with no verbal instructions, but it is a vast improvement on the assembly manual that comes in the box. There is no doubt that the Kettler Match 5.0 is an outstanding all-weather table. It offers an innovative playing surface that resists warping, as well as a sturdy frame. It features nice amenities such as ball holders and paddle holders. Therefore, if you have enough energy after wrestling with the assembly of this table, you should enjoy it immensely.